With S.S.R.I. 's now the most prescribed drugs for depression, it is easy to forget how high passions ran when the F.D.A. convened an expert panel in 1991 to weigh claims that Prozac and other S.S.R.I. 's may cause some patients to become suicidal. The panel's hearing in Bethesda, Md., was mobbed; its chairman wore a bulletproof vest. Dozens of people told stories like the one related by Melinda Harris. Blaming Prozac, she described how her father came into the kitchen one morning, picked up a 12-inch butcher knife and stabbed himself repeatedly in the stomach. Just as emotionally, advocates for the mentally ill pleaded with the panel to reassure patients that they could take Prozac with confidence. Representatives of Eli Lilly cited studies finding no connection between suicide and the drug, which had been on the market for almost four years. Despite the sharp conflict, the panel voted unanimously in Prozac's favor, and the controversy died down. To this day, the panel's findings are cited to rebut claims that the drugs can be harmful. But some of the early critics say the warnings demonstrate their prescience. "I feel vindicated," said Joseph Glenmullen, author of "Prozac Backlash," a fierce critique of antidepressants. "These companies have vehemently denied this side effect for over a decade, and now their own data indicate there's a significant risk." The British regulators said that their analysis of the nine studies of Paxil found 3.2 times the likelihood of suicidal thoughts or suicide attempts among teens and children given the drug as among patients given a placebo. 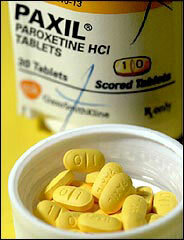 They also said that Paxil has not proved effective against depression in children and teenagers. Some experts suspect that in the first few weeks of therapy, drugs like Paxil can shove a small number of patients toward a mental precipice, perhaps because they can cause a severe form of restlessness known as akathisia. Patients who make it through the first weeks of drug therapy uneventfully do fine on the medication on the long term, these experts say. Teenagers and children seem particularly vulnerable, said Dr. Mark A. Riddle, director of the division of child and adolescent psychiatry at the Johns Hopkins Children's Center. "Kids tend to get quite activated, especially on adult doses of S.S.R.I. 's," said Dr. Riddle, who in 1991 conducted one of the first studies of the drugs in younger patients. "We had a lot of cases of kids who became so disinhibited they did reckless things," he said, describing those early findings. In recent years, most debate among doctors and researchers about the S.S.R.I. 's has focused on whether they are effective, rather than whether they are safe. Dr. David Shaffer, a researcher at Columbia University, noted that teenage suicides have fallen significantly in every country where Prozac and its cousins are in widespread use. "This amazing, undreamt of and unhoped for reduction in suicide rates is probably the result of more liberal treatment of young people with S.S.R.I. 's, and it's suggestive that these drugs may be responsible for saving a lot of lives," Dr. Shaffer said. "The introduction of S.S.R.I. 's has been a revolution." Yet most studies — including those recently reviewed by British and American health regulators — have found that S.S.R.I. 's are no more effective in fighting teenage depression than sugar pills. Even in adults, S.S.R.I. 's have been found to offer only modest benefits. In about half of all adult tests, the drugs prove no more effective than placebos. On average, they reduce symptoms of depression by about 41 percent on a widely used scale, versus a 31 percent reduction among those taking placebos, according to a survey in 2000 of studies used by the F.D.A. in approving the drugs. Researchers, moreover, have not been able to analyze much of the data on the drugs, because they have not been made public. GlaxoSmithKline, for instance, has acknowledged that just one of its nine studies of Paxil in children and adolescents has been published — a study that made only passing mention of suicide and concluded that the drug was effective against depression. According to the F.D.A., the combined results of all nine trials show that the drug is not effective against depression in patients under 18. Of the S.S.R.I. 's, only Prozac is approved by the F.D.A. to treat depression in children and teenagers, although doctors also widely prescribe the others.